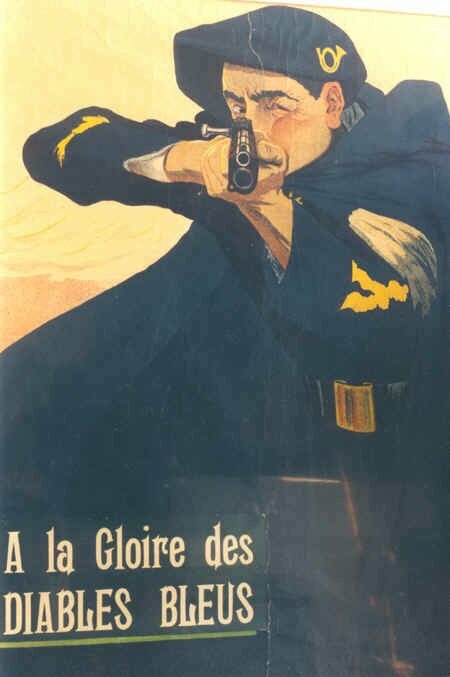 The famous Blue Devils, the Chasseurs Alpins. Two battalions fought in Morocco with the French forces just prior to WWI. 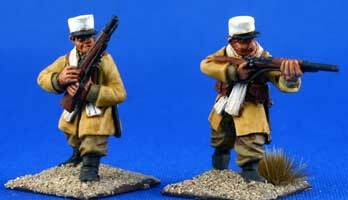 Like most of the French troops in Morocco, they were withdrawn to France in 1914. 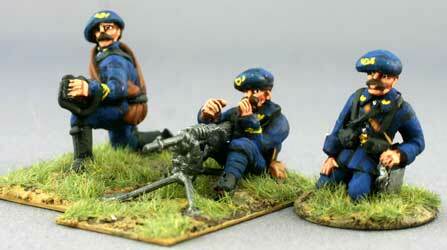 You can use these figures in any actions from their beginnings in the 1870s through the opening years of WWI. Twenty-one Chasseurs Alpins. Nine Chasseurs firing, nine Chasseurs on guard, and one each Officer, bugler and NCO leading. The officer's cane and the NCO's rifle are separate pieces. Note: One cane is included for the officer. Shown but not included are optional canes that the troops carried strapped to their packs. I recommend you fashion these from paper clips or piano wire if desired. This product was added to our catalog on Thursday 10 May, 2007.